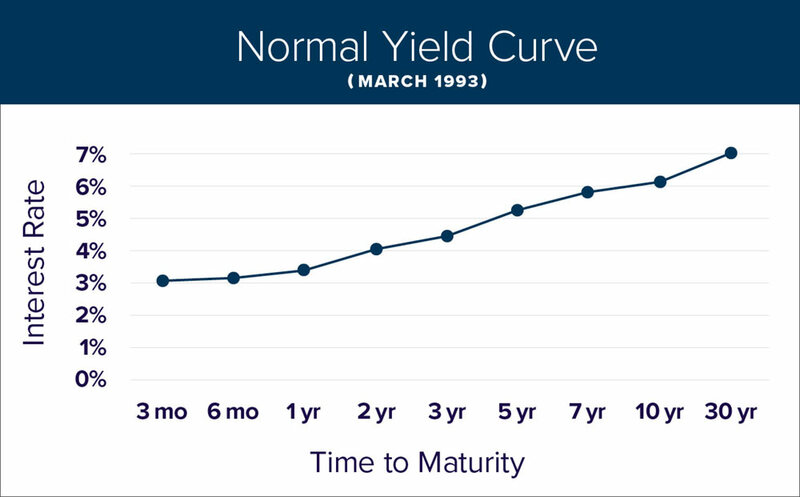 In its most basic form, a yield curve is nothing more than a line that plots the interest rates (or yields) of bonds with different maturities at a given point in time. The most common yield curve discussed in the financial press is the U.S. treasury yield curve. In the example below, the interest rates of U.S. government debt with maturities ranging from 3 months to 30 years are plotted and connected with a line. You will notice that as maturity increases, so does the interest rate paid to investors. This is what we call a “normal” yield curve. When the yield curve inverts, longer-term debt instruments have a lower yield than shorter debt instruments. Typically, this occurs when the economy begins to slow, the Federal Reserve is expected to cut interest rates to stimulate the economy, and investors expect short-term interest rates to fall sharply as a result of the first two factors. In the example below, from December of 2000, U.S. government debt maturing in 3 months had a higher yield at 6.1% than debt maturing in 10 years that had an interest rate of 5.2%. Historically, an inverted yield curve has been a predictor of recessions. Specifically, the interest rate on U.S. government debt maturing in 3 months has been greater than the interest rate on U.S. government debt maturing in 10 years prior to every U.S. recession over the past 50 years. The example below looks at this topic a little differently and highlights the premium an investor receives for holding longer-term U.S. government debt vs. shorter-term government debt over the past 35 years. 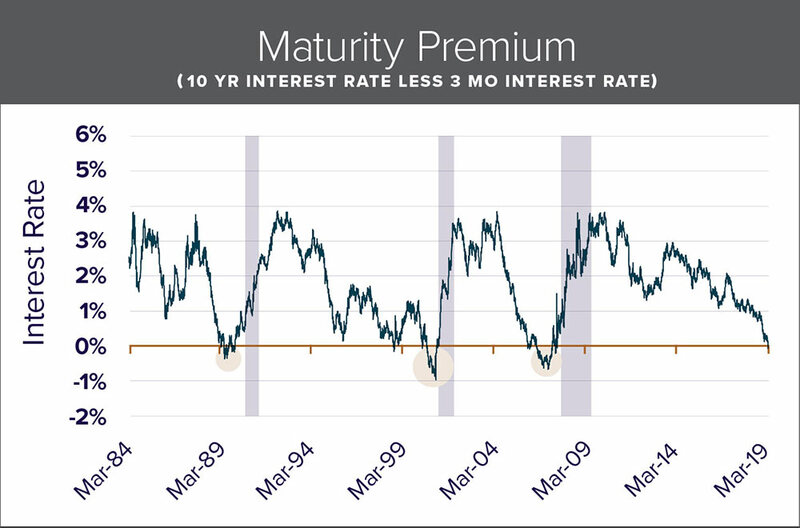 During this time period, there were three occurrences where that premium was negative (short-term interest rates were higher than longer-term interest rates). These are the periods where the yield curve was inverted, and all three periods were followed by a recession (highlighted in gray). 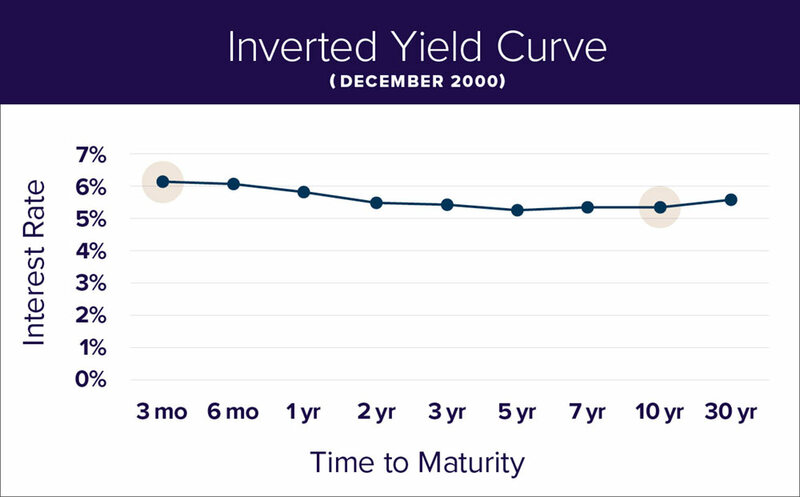 Currently the yield curve is inverted; should you be worried about a recession? In short, we don’t believe we need to be worried about a recession in the near term. First, the yield curve inversion has typically lasted for several months prior to a recession. That is not the case today. With only a handful of occurrences, the yield curve would need to remain inverted for quite a while longer before it became worrisome as a recession indicator. Second, the major central banks of the world (U.S. Federal Reserve, European Central Bank, Bank of England, Bank of Japan, etc. ), have been very active over the past few years. They have purchased trillions of dollars of bonds, actively depressing the interest rates on longer-term government bonds. In fact, there is a significant amount of government debt overseas that currently carries negative interest rates. Should we see a significant yield curve inversion in the U.S., it may prove to be a false signal due to all the central bank activity. Third, the labor market is quite strong today. Unemployment is below 4% and the total number of job openings currently exceeds the number of people looking for work. There is, however, one scenario that would concern me with regard to an inverted yield curve, and that is the “self-fulfilling prophecy.” Should consumers get so concerned about the possibility of an inverted yield curve (and the potential for a near-term recession) that they reduce spending, delay home improvements, or put off buying their next car, this would cause economic growth to slow. In the same respect, if businesses misinterpret the bond market’s signals and cut back on capital expenditures or reduce research and development spending, this would also be negative for the economy. In conclusion, while we don’t believe the yield curve is signaling an imminent near-term recession today, my colleagues and I will be monitoring the situation carefully.